A beautiful amethyst gemstone is captured in its organic form. This natural stone is rich in color and full of sparkle. 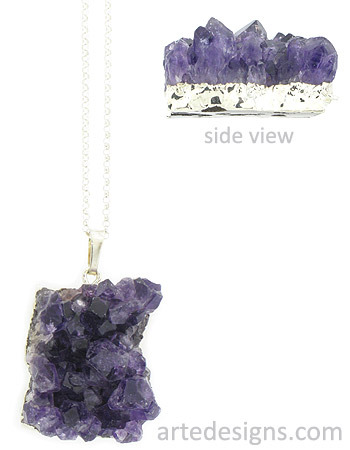 Amethyst is said to bring serenity and peace of mind. It also helps prevent homesickness. It is the symbol of security. Pendant is slightly over 1 inch high, just under 1 inch wide, and has silver plating around the edges. Three necklace lengths are available. Choose an adjustable 16-18, 18-20, or 24-26 inch sterling silver rolo chain with a lobster clasp. Compare Necklace Lengths Here.